Title: Where Does It Say That? A collection of photos of original documents showing the problems of Mormonism. 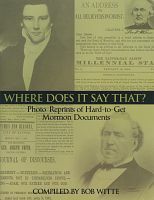 Useful witness tool for those that enounter the mormon question, "Where does it say that?"